The full list makes for interesting reading. Jessamyn has a version of the list that includes names, not just our fanciful titles. (“Metadata Man”? Can’t I be “Spark Plug” or “On a mission?”) Certainly a lot more happens with libraries than I ever think about. Update: Bobbi Newman has a version with blogs too. 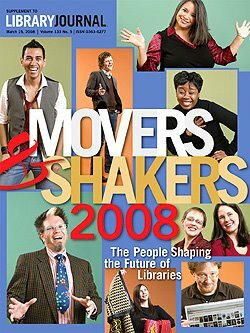 Movers and Shakers been going on since 2002, long before LibraryThing thrust me into the library world. A number of my favorite library bloggers and technologists have won it before, including Jessamyn West, Steven Cohen, John Blyberg, Meredith Farkas, Nicole Engard, Emily Lynema and Casey Bisson. As much as I want to congratulate people, I know few of the current batch, and wouldn’t have much to add. I do know Josh Ferraro of LibLime. LibLime is the driving force behind the open-source library system, Koha, that is suddenly on everyone’s lips. We’re eager to get LibraryThing data into Koha—beyond LibraryThing for Libraries, which already works—but Liblime may be too busy scaling to write the code anytime soon. * Fortunately, unlike all the closed systems, if LibLime can’t do it, we can do it ourselves. That kinds of openness is just one of the many reasons Koha is taking over the world. Marshall Shore (“The Man Who Said No to Dewey”). Shore is the guy behind Maricopa’s move from Dewey to a modified BISAC system. I have mixed feelings about BISAC, but Dewey needs to be replaced, and experiments are good. I met with a member of his team at a conference; I’m eager to get their system into LibraryThing and they indicated they were willing. Maria Redburn, Bedford Public Library. I’ve never met Ms. Redburn, but Bedford, a small-ish town in Texas, was the second library to enhance their catalog with LibraryThing for Libraries. Apparently Redburn took over in rocky times–the town was considering outsourcing library management to a company in Delaware. She turned the library around, winning approval for local control, expanded service and a new focus on customer service. Good stuff! Darci Hanning, the force behind the Plinkit project, which provides free, low-hassle websites for libraries. I only heard about them two days ago; Casey is a big fan, and has a blog post about it coming up. Mark Greek, DC Public Library. Greek worked to rescue and preserve rare materials from the Georgetown Neighborhood Library, devastated in a fire. That was my local library when I lived in DC, so a big thumb-up from me! *I need to dust off my PERL though!